When you’re on a hot streak, the last thing you want is to have days between action–you want to keep the ball rolling. 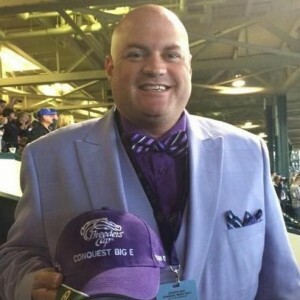 Needless to say, I wasn’t too excited about last Sunday’s card coming off the turf in five of nice races–including the finale which saw a good portion of the field (including the horse that was to be my top pick) scratch. Then add in two “dark” days, and here I am chomping at the bit. So far, my “Bail-out Special” was been a winner four of the eight days of the meet where the horse I tabbed actually got into the starting gate–and today, I feel a pretty decent chance of getting OVER the .500 mark. The finale is a turf marathon at 12 furlongs. There are a dozen runners slated to run the mile and a half to cap off the Wednesday card. Two of the horses, #1 KREWE CHIEF and #3 LOCAL HERO are trained by Mike Maker, who has a propensity to win these type of races at Keeneland, as he’s enjoyed much success in the past. Although I think the rail horse will have something to say about how the race is run, and he should hit the board, he’s not my pick to win. The #3 horse should be an also-ran. #7 TAKE THAT FOR DATA is intriguing in the finale as he’s hit the board in three of his last five turf routes. He’s yet to tackle this distance, and is a “wild card” for me here. The morning line favorite #8 NEEPAWA used his last race (the first off the bench since September of last year) as a tune-up for this race, as he only contested a mile on the Gulfstream turf on March 30. He’ll come into this race fresh, and could make some noise. #10 ROYAL ARTILLERY has the pedigree to get the distance and has speed figures that are close to par for a race like this, but hasn’t fared well finishing lately. That could change today here, so he’ll be a horse I use underneath, at a decent price. #12 SARRASIN drew the far outside post, but at three turns, that far outside post becomes negated. He’s won twice and placed in three attempt at this distance. For that reason only, he’ll be bet heavily in this race, and I wouldn’t be in surprised in the least to see him the post-time favorite over Neepawa. My “Bail-out Special” for today however, is #4 ZUMURUDEE (6-1) for trainer Michael Stidham and jockey Tyler Gaffalione. Draw the proverbial line through his latest start, which was a non-effort following two months away from the track, and he fits here well. Although he did not hit the board in his only start at 12 furlongs, he does have the requisite pedigree to get the distance. He’s hit the board in ten of fifteen career starts, so he has a nose for the wire, and come in fresh today. Expect Krewe Chief to be on or near the early lead (something he does in turf routes, but didn’t do in graded stakes on the dirt at Fair Grounds this winter), and be a factor early where he’s definitely experiencing some class relief, albeit on a different surface. Neepawa and #11 GETTYSBURG should be forwardly placed, and Royal Artillery should sit behind the frontrunners. Sarrasin, Take That for Data and Zumurdee should be further back, setting up for a sustained late run. The finish won’t be an easy one, but Zumurdee should be one of the horses charging towards the wire late, and with some decent odds attached to him. We’ll take our chances on him today as the “Bail-out Special”. Play #4 Zumurdee on top of exactas and trifectas with #1 Krewe Chief, #7 Take That for Data and # 10 Royal Artillery underneath.